Welcome to edition 457 of Insider Weekends. 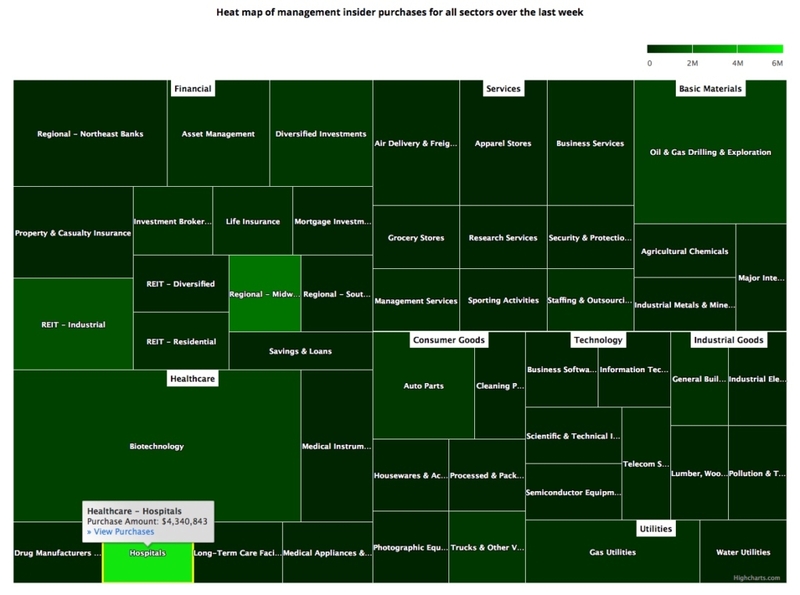 Insider buying declined again last week with insiders purchasing $53.36 million of stock compared to $80.53 million in the week prior. Selling also decreased with insiders selling $1.58 billion of stock last week compared to $2.37 billion in the week prior. Sell/Buy Ratio: The insider Sell/Buy ratio is calculated by dividing the total insider sales in a given week by total insider purchases that week. The adjusted ratio for last week edged up slightly to 29.56. In other words, insiders sold almost 30 times as much stock as they purchased. The Sell/Buy ratio this week compares unfavorably with the prior week, when the ratio stood at 29.38. Director Ronald O. Perelman acquired 355,000 shares of this beauty care products company, paying $19.90 per share for a total amount of $7.07 million. These shares were purchased indirectly by by MacAndrews & Forbes Incorporated. Revlon’s stock dropped sharply earlier this month after the company reported disappointing fourth quarter results where revenue declined 5.7%. What spooked investors even more was the company’s decision to delay the filing of its annual report after disclosing that “it identified a material weakness in its internal control over financial reporting as of year-end 2018”. The stock started the month at $26.52 and dropped to $18.02 by March 19th. 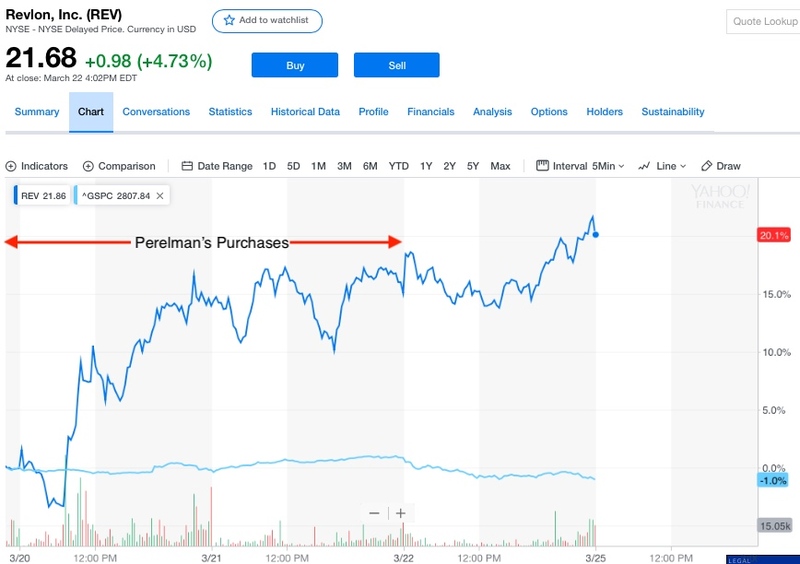 Mr. Perelman’s purchases took place on March 20th and 21st and the stock rebounded nearly 20% through the end of last week even in a weak market as you can see from the chart below. Perelman’s Revlon Purchases. Chart Source: Yahoo Finance. Revlon’s second largest shareholder, Mittleman Brothers, was probably worried about Mr. Perelman taking the company private and wrote this letter to the CEO and the board urging them to obtain a standstill agreement from Mr. Perelman so that he does not increase his stake to 90% and then attempt to take the company private via a short-form merger. MacAndrews & Forbes presently does not intend to increase its beneficial ownership above 89% of the issued and outstanding Revlon Class A Common Stock (“Common Stock”) or to undertake transactions to take Revlon private. (4) negotiate with that special committee regarding the terms of such transactions by MacAndrews & Forbes, in order to promote the interests of all shareholders, including minority shareholders. The agreement in this paragraph shall terminate on the first anniversary of the date hereof, unless extended in writing by MacAndrews & Forbes prior to such date. For the avoidance of doubt, this letter should not be construed as an admission by MacAndrews & Forbes that any of the assertions made in the Mittleman Letter have any merit whatsoever. You can view the list of recent insider transactions for Revlon, Inc. here. President and CEO Thomas F. Karam acquired 250,000 shares of this natural gas pipeline company, paying $20.47 per share for a total amount of $5.12 million. These shares were purchased indirectly by E.T. Associates, L.P. The spinoff was affected late last year and EQT maintained a nearly 20% interest in ETRN after issuing 0.8 shares of ETRN for each share of EQT held. If you subscribe to Joel Greenblatt’s philosophy of paying attention to spinoffs and following the actions of the insiders of the new spinoff, then this purchase appears to be bullish. Mr. Karam started his career in investment banking and later served as the CEO of three companies in the oil and natural gas industry that were eventually acquired. You can view the list of recent insider transactions for Equitrans Midstream Corporation here. Vice Chairman and Co-Founder Rocco A. Ortenzio acquired 306,189 shares of this medical care company, paying $14.18 per share for a total amount of $4.34 million. These shares were purchased indirectly through a trust. You can view the list of recent insider transactions for Select Medical Holdings Corporation here. Executive Chairman & President Bradley Vizi acquired 637,000 shares of this engineering & construction company, paying $3.92 per share for a total amount of $2.49 million. These shares were purchased indirectly by various trusts and entities. You can view the list of recent insider transactions for RCM Technologies, Inc. here. Chairman & CEO Paul B. Murphy acquired 50,000 shares, paying $19.93 per share for a total amount of $996,438. Mr. Murphy increased his stake by 11.19% to 497,008 shares with this purchase. President & COO Samuel M. Tortorici acquired 50,000 shares, paying $19.90 per share for a total amount of $995,000. Mr. Tortorici increased his stake by 63.06% to 129,286 shares with this purchase. EVP & Chief Financial Officer Valerie Toalson acquired 4,984 shares, paying $20.06 per share for a total amount of $99,979. Ms. Toalson increased his stake by 8.55% to 63,258 shares with this purchase. Director William B. Harrison acquired 3,188 shares, paying $20.00 per share for a total amount of $63,746. Mr. Harrison increased his stake by 3.51% to 94,107 shares with this purchase. Director Richard J. Fredericks acquired 3,001 shares, paying $20.00 per share for a total amount of $60,007. Mr. Fredericks increased his stake by 20.01% to 18,001 shares with this purchase. Director Scott M. Stuart acquired 1,563 shares, paying $20.00 per share for a total amount of $31,253. Mr. Stuart increased his stake by inf% to 1,563 shares with this purchase. Director Virginia A. Hepner acquired 781 shares, paying $20.00 per share for a total amount of $15,617. Ms. Hepner increased his stake by 8.49% to 9,984 shares with this purchase. Director Precious W. Owodunni acquired 60 shares, paying $19.97 per share for a total amount of $1,198. You can view the list of recent insider transactions for Cadence Bancorporation here. Director Robson S. Walton sold 1,649,023 shares for $98.88, generating $163.06 million from the sale. These shares were sold indirectly by a trust. Executive Vice President Gregory S. Foran sold 74,019 shares for $100.00, generating $7.4 million from the sale. You can view the list of recent insider transactions for Walmart Inc. here. Director Charles Heilbronn sold 242,432 shares for $334.99, generating $81.21 million from the sale. Chief Executive Officer Mary N. Dillon sold 120,949 shares for $334.42, generating $40.45 million from the sale. These shares were sold as a result of exercising options immediately prior to the sale. Chief Financial Officer Scott M. Settersten sold 29,529 shares for $338.64, generating $9.99 million from the sale. These shares were sold as a result of exercising options immediately prior to the sale. 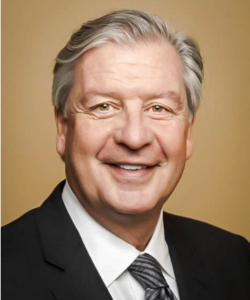 Director Dennis K. Eck sold 15,000 shares for $336.06, generating $5.04 million from the sale. Chief Human Resources Officer Jeffrey J. Childs sold 9,757 shares for $333.89, generating $3.26 million from the sale. These shares were sold as a result of exercising options immediately prior to the sale. Director Lorna Nagler sold 4,500 shares for $337.62, generating $1.52 million from the sale. These shares were sold as a result of exercising options immediately prior to the sale. Director Robert F. Diromualdo sold 3,098 shares for $337.12, generating $1.04 million from the sale. GC and Corporate Secretary Jodi J. Caro sold 2,511 shares for $334.52, generating $839,985 from the sale. These shares were sold as a result of exercising options immediately prior to the sale. Director Catherine Ann Halligan sold 704 shares for $342.97, generating $241,451 from the sale. You can view the list of recent insider transactions for Ulta Beauty, Inc. here. Director David A. Duffield sold 175,000 shares for $186.18, generating $32.58 million from the sale. Co-President & CFO Robynne Sisco sold 40,000 shares for $195.29, generating $7.81 million from the sale. These shares were sold as a result of exercising options immediately prior to the sale. Co-President Gomez Luciano Fernandez sold 7,344 shares for $186.45, generating $1.27 million from the sale. Chief Products Officer Petros Dermetzis sold 2,257 shares for $186.36, generating $420,606 from the sale. You can view the list of recent insider transactions for Workday, Inc. here. Chairman & CEO Hubert Joly sold 139,133 shares for $68.53, generating $9.53 million from the sale. Chief Merch & Mktg Officer Rajendra M. Mohan sold 44,619 shares for $68.53, generating $3.06 million from the sale. CFO Corie S. Barry sold 27,788 shares for $68.55, generating $1.9 million from the sale. General Counsel & Secreta Keith J. Nelsen sold 24,374 shares for $68.55, generating $1.67 million from the sale. CHRO & President, U.S. Retail Kathleen Scarlett sold 4,703 shares for $68.58, generating $322,539 from the sale. SVP, Finance-Shared SVCS & CAO Mathew Watson sold 1,990 shares for $68.58, generating $136,484 from the sale. You can view the list of recent insider transactions for Best Buy Co., Inc. here. Chairman of the Board David E. O’Reilly sold 34,000 shares for $375.48, generating $12.77 million from the sale. 25,500 of these shares were purchased indirectly through a trust. Director Lawrence P. O’Reilly sold 5,600 shares for $375.48, generating $2.1 million from the sale. You can view the list of recent insider transactions for O’Reilly Automotive, Inc. here. Disclaimer: I hold a long position in Workday (WDAY). Please do your own due diligence before buying or selling any securities mentioned in this article. We do not warrant the completeness or accuracy of the content or data provided in this article.